New BT400 Series Non-contact Bluetooth Radio Coupled Rotary Flange Torque Sensor | SensorData Technologies, Inc.
FOR IMMEDIATE RELEASE – October 14, 2013 – Shelby Township, Michigan, USA – SensorData Technologies (SensorData) (www.sensordata.com), a renowned industry supplier of standard and custom force, torque, load and strain sensors, transducers, and related instrumentation, has announced the global market introduction of the BT400 Series Bluetooth Non-contact Radio-Coupled Rotary Flange Torque Sensor. This high-performance torque sensor provides radio transmission of measured data, requires relatively little space for installation, and is capable of measuring torque up to 8000 lb-ft, at speeds up to 15,000 rpm. Featuring an SAE4340 alloy steel construction with satin nickel finish, the SensorData BT400 Series is available in six base models with rated capacities from 50-250 ft-lb to 8000 ft-lb and sensor diameters from 2.5” to 9”. The Series features nonlinearity and hysteresis specifications of 0.05% of rated output, a nonrepeatability specification of 0.02% of rated output, maximum load of 150% of rated capacity standard with higher overload protection available, and rotor deflection at rated capacity (typ.) of 0.29 degrees. The high torsional stiffness of this device, as well as its low rotating inertia, facilitates its increased frequency response. Units are designed to reliably operate over a compensated temperature range of –70° to +170°F, with useable range of –40° to +185°F. The specialized construction of the SensorData BT400 makes it immune to the harmful effects of EMI and ESD, as well as to interference by nearby metal structures. The new SensorData BT400 Series may be installed directly into a dynamometer driveline, where its compact design, Bluetooth communication capabilities, and non-contact operation eliminate the need for external couplings or expensive alignment procedures. Its encapsulated onboard electronics also facilitate remote shunt calibration, by providing strain gage (gauge) bridge excitation, bridge output amplification, and conversion of the amplified signal into a 16-bit digital word. This onboard signal amplification and automatic word signal conversion significantly reduces the unwanted effects of inherent conducted noise commonly found within other types of rotary torque measurement systems. Any computer system or electronic equipment with 2.4 GHz Bluetooth connectivity can receive BT400 wireless transmission data. The rotary torque measurement system can also transmit data to the remote Bluetooth Base Station that provides three analog outputs and a USB port for connection to a PC. The Bluetooth radio operates in the unlicensed 2.4 GHz ISM band and employs a frequency hopping transceiver to combat interference and fading. 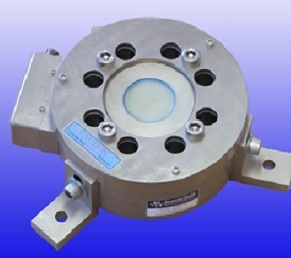 An optional zero-velocity speed sensor is also available. For a detailed list of available model variations and customization options, please consult the factory.